The city corporation from Oct 14 will officially commence the collection of parking fees for four wheeler’s at the widened Ramlingkhind Galli. This is on a trial basis. The staff of the corporation will issue digital machine receipt and one will have to shell out Rs.30 for three hours or part thereof. The Ramlingkhind galli was widened to 60 feet even when the residents wanted it to be 45 feet which would have saved many their house. 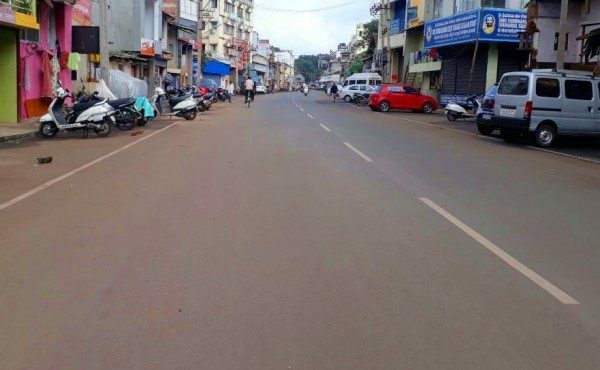 But the corporation said it is a major road where processions pass by and hence 60 feet is required, and now the corporation is officially making it a parking zone. So was this road widened to make a a parking zone ? So many people lost their land, buildings a few lost 100% of their house who are homeless and no compensation was paid to any one as per our knowledge as yet and now the corporation will earn money, is this fair the residents of Ramlingkhind Galli are asking. A resident said we gave our land for free (as we did not get any compensation) and now the corporation will earn money from our land, is this proper ?